A lot of geospatial data has become available at no charge in many countries recently. Geospatial data that is currently made available by government agencies usually do not follow the linked data paradigm. In the few cases where government agencies do follow the linked data paradigm (e.g., Ordnance Survey in the United Kingdom), specialized scripts have been used for transforming geospatial data into RDF. In this paper we present the open source tool GeoTriples which generates and processes extended R2RML and RML mappings that transform geospatial data from many input formats into RDF. 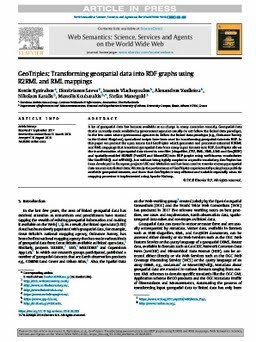 GeoTriples allows the transformation of geospatial data stored in raw files (shapefiles, CSV, KML, XML, GML and GeoJSON) and spatially-enabled RDBMS (PostGIS and MonetDB) into RDF graphs using well-known vocabularies like GeoSPARQL and stSPARQL, but without being tightly coupled to a specific vocabulary. GeoTriples has been developed in European projects LEO and Melodies and has been used to transform many geospatial data sources into linked data. We study the performance of GeoTriples experimentally using large publicly available geospatial datasets, and show that GeoTriples is very efficient and scalable especially when its mapping processor is implemented using Apache Hadoop.